God has seen you cry, struggling with something. God says its over. A blessing is coming your way. 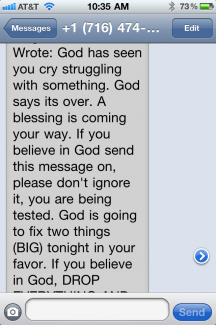 If you believe in God, send this message on, please don’t ignore it, you are being tested. God is going to fix two things (BIG) tonight in your favor. If you believe in God, DROP EVERYTHING AND PASS IT ON. TOMORROW WILL BE THE BEST DAY OF YOUR LIFE. DON’T BREAK THIS CHAIN. IF YOU BREAK, YOU WILL SUFFER. SEND THIS TO 14 FRIENDS IN 10 MINUTES WHEN U READ IT. “Whats ur name?” He said. And on and on it went until the undercover prayer chain deliverer was revealed. Because I imagine at some point you too have received one of these prayer chains. Right? This was my initial reaction to the message I received last night. I didn’t share my thoughts with the person who texted me because his intentions were from a heart of childlike faith (the texter was my young nephew).